Just as automakers like to periodically refresh their vehicle line up, they also like to refresh and update their dealership architecture and experience. Under the tagline “Destination Porsche,” the German carmaker has rolled out a new look with the goal of making its dealerships a central gathering place for the Porsche community and appealing to current as well as new customers. The first prototype of the new concept is now on view in Palm Springs, California. According to the carmaker, the concept for “Destination Porsche” is based on changing customer needs. The Porsche Centres will consist of several content areas that can be flexibly designed, and in which digital media can help address customers individually. They will become places to experience and touch the brand. 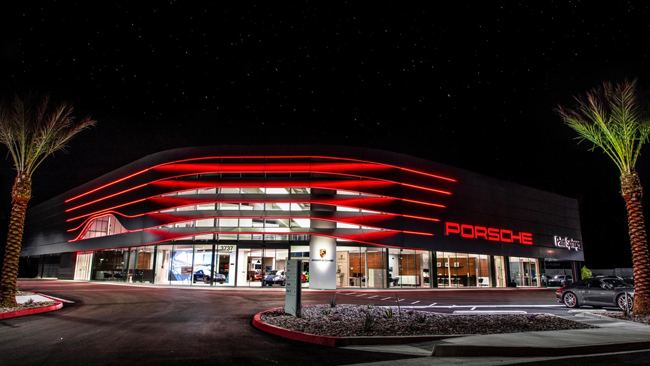 The customer journey through new Porsche dealerships runs along various themed modules that can be flexibly integrated and adapted. This makes the interior easy to customize towards regional or individual characteristics. The modules represent for instance current Product Highlights, E-Performance or Certified Pre-Owned cars. Another focus is on social spaces with a newly created lounge area where customers and fans can come together. Through a large window, they can glance into the workshop – similar to the “look inside the kitchen” in a restaurant.